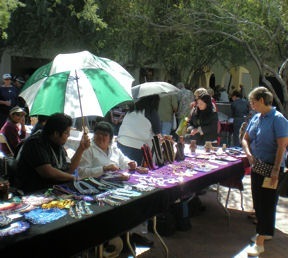 One of the country’s premier Indian fairs and markets attracts collectors to the Heard Museum grounds in downtown Phoenix the first weekend of March. 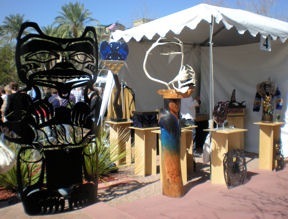 More than 700 Native American artists display a vast array of original arts and crafts. The artisans come from all over America, not just Arizona. To participate each artist must be jurored into the show, a prestigious acknowledgement of the quality of their work. 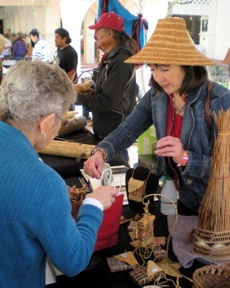 A basket weaver from the Pacific Northwest Coast creations represent traditional woven items of the region. While Southwest Indian art is well represented. 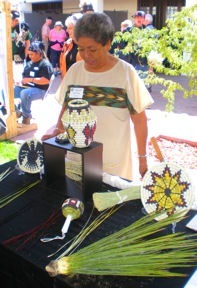 Tribal members from around the country exhibit contemporary and traditional art forms. 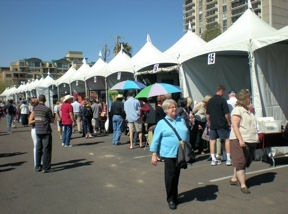 Rows and rows of booths and large exhibit tents gives each artist individual space to display their work. Whether one is a serious collector or just looking for an inexpensive keepsake shoppers get to met the person who created their chosen purchase. 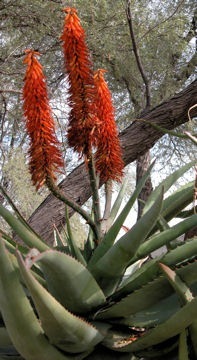 The green yucca plant is an important material for Hopi basket makers. 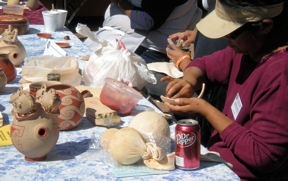 This Hopi artist was happy to explain the process from gathering the natural materials to finished product. The more we learn the more we appreciate the time, talent and skill involved in creating each piece. 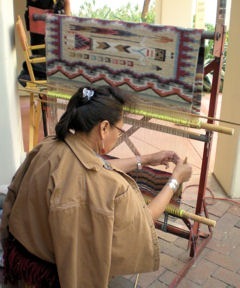 Many of the traditional designs have been passed down through several generations. 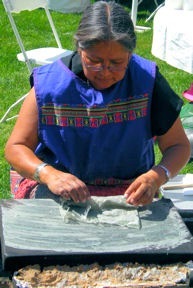 Artists often say they first learned from their grandmothers. 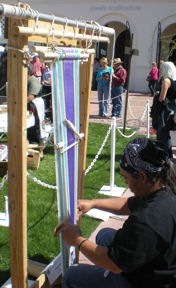 Throughout the weekend artist demonstrations let us view the creative process. Whether it’s working a flat piece of silver into a lovely necklace or transforming a lump of clay into a pottery figurine shoppers enjoy watching the artists at work. Questions are willingly answered. As we talk with the artists we witness an unique balance of modesty and pride in their art form. Music, including R. Carlos Nakai, and dance performances give attendees a break from shopping. There is so much to take in we find it helpful to switch focus from time to time. 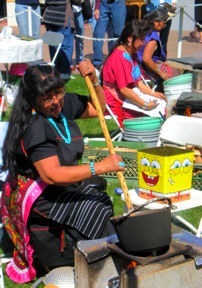 Each year a different tribal group is featured, the Hopi in 2009 and bands of the Apache people in 2010. 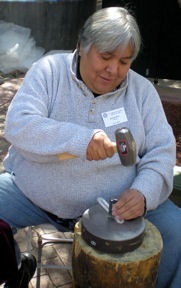 “Apache Peoples and Arts” will highlight elder artists, food, a wikieup (traditional Apache lodging), and storytelling by Apache entertainer Ken Duncan. What would an event be without food? Not to worry, there are plenty of opportunities to nosh our way through the day. Of course, there is traditional Indian fry bread. We fascinated to watch the Hopi piki maker. Piki is a thin rolled bread made with fine blue corn flour and culinary ash. The maker spreads a thin layer of the batter on a hot griddle with her hand. Almost immediately the practically transparent layer of piki is ready to be rolled. Watching the labor intensive steps we understand why this is a rare treat. Apache acorn soup will be available in 2010 as well as selections ranging from Cajun and Mexican specialties to gelato. 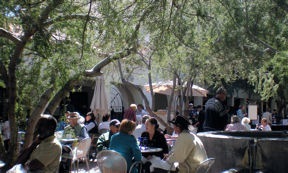 Tables in the tree shaded courtyard are the perfect place for people watching as we have lunch. Indian Fair tickets include admission to the ten galleries of the Heard Museum. However, we found so much to do and see at the Fair & Market that the museum had to wait for another day. Gates swing open for general admission both Saturday and Sunday from 9:30am – 5pm. 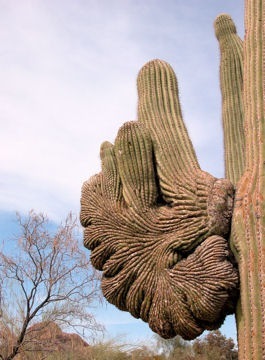 Residents and visitors in the Phoenix/Scottsdale region can enjoy a FREE visit to the Desert Botanical Garden tomorrow, February 9, 2010, from 1-8pm. The garden occupies 50 acres of Papago Park, and is home to a broad collection of desert plants and foliage. Join a free docent tour to learn secrets and myths of common and rare species. Plants & People of the Sonoran Desert Loop Trail. Take a leisurely break at the Patio Cafe for lunch or afternoon refreshment. 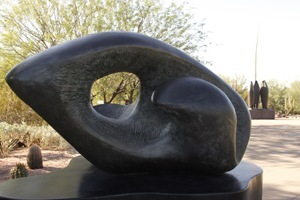 In cooperation with the Heard Museum an exhibit of Allan Houser’s bronze sculptures currently enriches the garden experience. 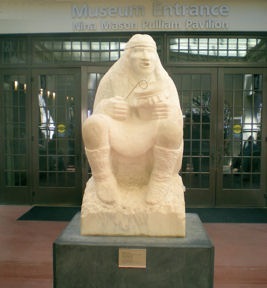 A renowned Native American artist, Houser gained world-wide recognition for his modernistic works before his death in 1994. Whether you can take advantage of the February 9, 2010 FREE day or not put the Desert Botanical Garden on your “To Do” list while in Phoenix. Click to see a slide show of Desert Botanical Gardens images. Phoenix public transportation got a huge boost when Metro Light Rail opened in late December 2008. Twenty miles of the system is complete; carrying passengers from central Phoenix (north of downtown) to the west side of Mesa. The route runs near Ballpark Arena, Papago Park, Downtown Tempe, Arizona State University and Sun Devil Stadium. From the 44th and Washington station a shuttle connects passengers with all four terminals at Phoenix Sky Harbor Airport. An automated train route around the airport that will connect with Metro is under construction. Riding the route end to end requires about 70 minutes. Downtown Phoenix to downtown Tempe takes 25 minutes. If you’ve ever been jammed on a Phoenix freeway when traffic comes to a crawl you’ll love the Metro option. Fares are $1.25 for one ride or $2.50 for the entire day. Tickets may be purchased at machines in each station. Don’t forget to validate the ticket after purchase before boarding the train. On weekdays trains operate about every 10 minutes from 6am – 7pm, 20 minutes apart other operating hours. On weekends and holidays trains arrive every 15 minutes 6am-7pm, 20 minutes early morning and until 11pm. During our Phoenix visit the hotel was one block from a Metro station, we used it to avoid traffic and parking at the Heard Museum Indian Fair and to dinner downtown. We found the stations to be clean and well lit with shaded waiting areas. Each station is individualized with public art. At the Osborn/Central station bronze shoe and foot prints traverse the platform, a fun element but not especially outstanding as a work of art. More dramatic and eye-catching sculptures, murals and decorative walls adorn other stations. It’s a treat to find a city in the Southwest where you can get to cultural, sports, parks, shopping and dining via light rail. Cheers for the option of getting off the road onto light rail in Phoenix. As night descends on the Desert Botanical Garden the Chihuly: The Nature of Glass exhibit becomes even more dramatic and intriguing. Photographs can’t fully capture the entire essence of the evening illumination. Tickets are timed for four-hour blocks, visitors may enter at any time during the four-hours. The 4pm – 8pm ticket with arrival near 4pm allows time to see the exhibit in daylight, enjoy a snack or dinner break at the Patio Cafe during sunset and experience the glass and gardens under the clear Arizona night sky. Reservations are strongly advised, evenings frequently sell out. Chihuly: The Nature of Glass exhibit runs through the end of May 2009. If you’re anywhere near the Phoenix area include a visit to Desert Botanical Gardens and the Chihuly exhibit. You’ve never before seen anything like it. Click here for more Chihuly Nature of Glass at the Desert Botanical Garden.